The Holman translation does an excellent job*** (see below) in communicating what I believe is the primary intent of Jesus’ teaching here on prayer – that we should ask and KEEP ON asking. Prayer is NOT a one time thing. (e.g., Jesus’ teaching on prayer in Luke 18:1-8 or Luke 11:5-13 for a fuller understanding of this exact theme.) Jesus is teaching his disciples in these passages the concept of “importunity,” or bold, persistent and shameless asking. In the Greek, this is shown by the verbs “asks”, “searches” and “knocks” in vs 8 being in the Greek participle form – indicating an ongoing and continuing activity – asking, searching and knocking. ‘Is the same dynamic also going on in James 4:2?’ wondered our dear church member. Interestingly – it is not. James 4:2 has the same verb here as an infinitive in the present tense – meaning “to ask.” That said, I did notice that the verb was in the middle voice – which indicates that a more proper translation might be – “You have not, because you ask not, for yourself.” The middle voice of a verb indicates action that happens to yourself – to wash yourself, to dress yourself, etc. James 4:2 is saying, in essence – you lack many good and spiritual blessings for yourself, because you are not asking for those good and spiritual blessings, for yourself. This is an intensely personal passage that speaks of boldly and unselfishly asking for beneficial things from God. How interesting! Two more things to point out here, as you ponder that: #1 – The verbs used in James 4 are in the plural sense, as are most command type verses in the New Testament epistles. We miss this in English because, one of the great flaws in our language is that second person singular and plural are both “you.” What does it mean that the teachings in James 4:2 (and most every other Bible passage) are expressed in a plural sense? It means that, primarily, the Bible was written to a people – not to an individual. That certainly doesn’t mean that we can’t take God’s Word as personally and individually applying to our lives – but it does mean that God’s Word was written to His people – plural – His church. We aren’t a bunch of maverick rogues – we are a family, a household, a Body of Christ. #2 James (in vs. 3) gives us one more important qualifier about what we should ask for. According to James, we sometimes ask God for things and don’t get those things, because we are asking God with wrong motives, evil desires or worldly goals. That doesn’t mean God doesn’t want to bless us; it does mean that God doesn’t want to destroy us with that which would draw us away from Himself – things like riches (read James 5:1) or other answered prayers that might serve to strengthen our friendship with the world. Bottom line: James challenges Christians to ask for every good blessing from God. He teaches us that we lack some of those blessings for ourselves (plural…and singular) because we aren’t asking for them. Concurrently, Jesus teaches us, in Matthew 7, Luke 11, and Luke 18, that the way to procure those blessings is to continually ask for them until God answers. 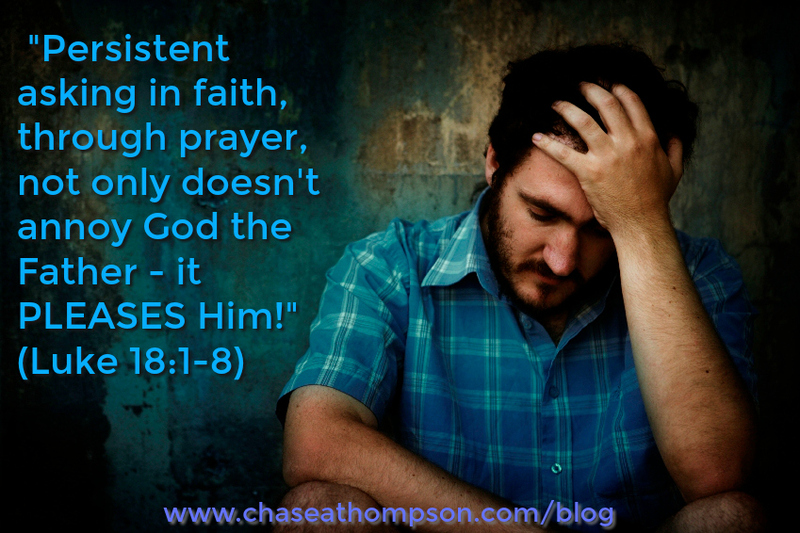 This kind of persistent asking in faith, through prayer, not only doesn’t annoy God the Father – it PLEASES Him! “To ask for yourself, and [it] will be given to you. To seek, and you will find. To knock, and it will be opened [for] you. For the one asking [repeatedly] receives, the one who is seeking [repeatedly] finds, and the one who is knocking [repeatedly] it will be opened.” Notice here that the participle action – the “ing” is in the second part of the verse in the Greek, rather than the first. Charles Spurgeon on Prayer, Part 3: Revive The Prayer Gathering in Your Church! Prayer Series, Part 6: We Have Not, Because We Ask Not…For Ourselves? !